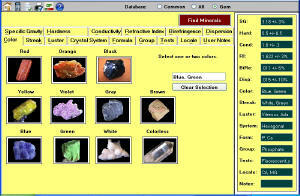 Mineral Search is an interactive, search oriented database of 700 minerals, designed for a Windows PC. The database includes 20 properties for each mineral and photographs for most. 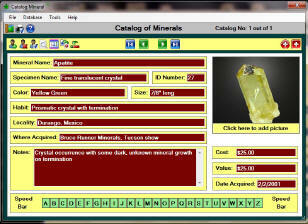 The software also includes a Cataloging tool for your mineral collection. Read about the program features below, and click on the photos above to view enlarged screen images. Browse (right) - This unique tool browses 18 minerals at a time, displayed photographically like a slide show, or use the Browser for quick, single-click navigation to a particular mineral. Mineral Name Search - Find over 600 primary and 1,000 more related mineral names. Property Search (left) - This is not just another generic word search, but highly customized to result in the most effective mineral identification search possible. Search for any combination of Specific Gravity, Hardness, Conductivity, Refractive Index, Birefringence, Dispersion, Color, Streak, Luster, Crystal System, Chemical Formula, Mineral Group, Locale, and more. Using Name Search, Browse, or Property Search to select a mineral takes you to its full display, with standard size photograph and 20 properties of that mineral. (See right). Subdatabase - Choose to work with All 700 Minerals in the database, or just the 300 most Common Minerals, or just the 110 Gem Minerals. Dana No: Included for each mineral. Sort either by Dana Number or alphabetically. Photographs - for almost all Common minerals as well as many uncommon ones. For less common minerals in the database lacking a picture, you can even add your own photographs. 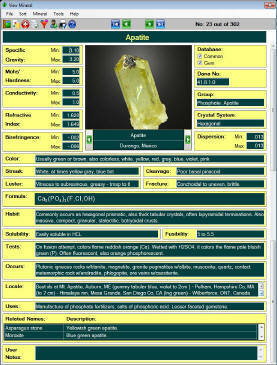 User Notes - The flexible database allows you to add more data to each mineral, save it, and search through it later. Record additional mineral locales, for example, or for the gemologist, add more optical data on a gem mineral. 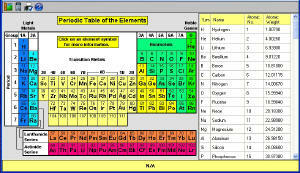 Add Mineral - For the serious mineralogist, add more minerals to the program’s flexible database. 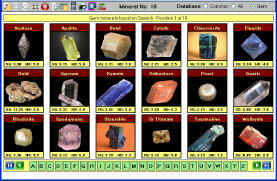 Then use the program’s pleasing interface and powerful search features as a “template” for those minerals, as if the added minerals were included in the original database. Glossary - including a convenient right mouse-click access feature in many cases. Catalog (left) - Catalog your mineral collection according to Photograph, Mineral Species, Specimen Name, ID No, Color, Size, Habit, Locality, Cost and Value, Where and Date Acquired, and Notes. Has a Browse feature, a powerful Catalog Search tool, a Sum function to value the collection, and an exporting module to print labels for your mineral collection. Software is distributed by download, and upon checkout, that file will be made available to you.